The board comes with a removable and adjustable fin which can help more experienced paddlers change the turning capabilities of the board. The paddle that comes with the board is also adjustable which is great because it means anyone no matter their size can use the board effectively. The Board has a weight capacity of 300lbs so if you weigh more than that or close to we wouldn’t recommend purchasing this SUP as it could sink, or may not be suitable for you in the future and you don’t want to waste $300 on a board you can’t even use! There is also an adjustable accessory strap, this is ideal if you are teaching somebody to SUP as you can put a life vest on their strap to make them feel more comfortable. It is also a good place to put a bottle of water for your paddling trip as you may become dehydrated. There is also an ankle leash attached to the board; this is a very helpful feature because if you now fall off of the board it won’t float away from you whilst you trying to get back onto it. 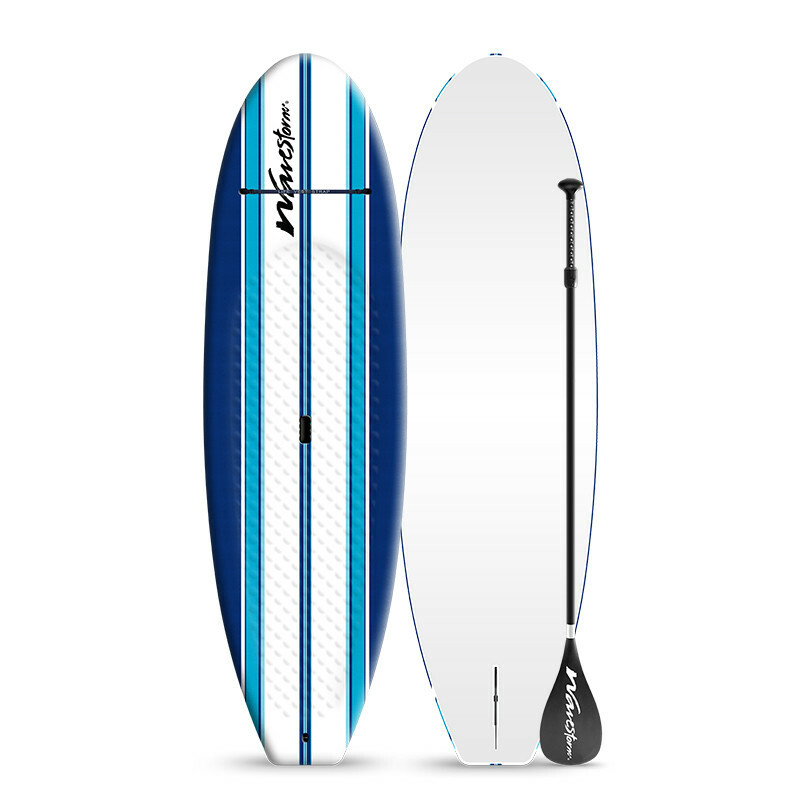 • Price, for two high-quality Paddleboards with all of the needed accessories $600 is a bargain! There is no price for how much fun you can have on the Board that is up to you. Although we would recommend checking that there are some adequate paddle spots near you before purchasing the board, or it would be a complete waste of money! • Personalization, because most of the parts that come with the board are easily adjustable which means you can change the length, width etc. to suit you. This will also probably save you some money in the long run as otherwise, you may want to buy a new paddleboard. • Lightweight, at 25lbs this board is just under the average. Not only does this make it better on the water but it is also a massive factor when it comes to transportation. Some boards weigh up to 45lbs which is a lot for people to be hauling down to the beach before tiring themselves out even more on the water. However, this board is perfect for everybody no matter their body type and can be easily carried anywhere with its adjustable handle. • Safety, with an ankle leash coming with the board as well as accessories strap they have definitely thought about the customer’s safety with this board. The accessory strap could be used to carry a life jacket/floatation device of some kind which will at least make you paddling partner feel more comfortable. • Made of foam, the fact that the boards are made of Foam not only makes it more relaxing on the feet but also makes the board much nicer to fall onto should you be a beginner paddler. I’m sure you would much rather fall onto foam over plastic! 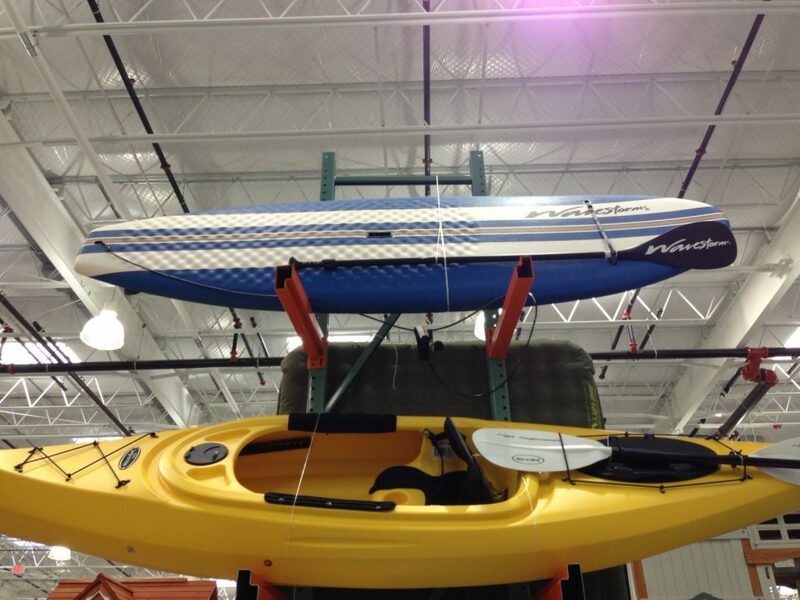 It also won’t be as slippy when you’re trying to get back onto the board in comparison to a plastic Paddle Board. • Easily damaged, because the board is made mainly from foam it is easy to damage and once the foam has been damaged it will never look the same again! Even if you glue it down that patch will be slightly higher than the rest of the board, therefore spoiling the appearance. • Weight Capacity, The board has a maximum weight capacity of 300lbs which is far too little for some people. If you want to use Paddle boarding as a way to lose weight then this could be the perfect way to stick to a routine as you will always have to make sure you stay under 300lbs. • Not for experienced paddlers, this board is not meant to go deep into the sea and take on major waves. If you try to do this on this Wavestorm board you may find yourself in a spot of bother. We would recommend only using this board in shallow waters. Make sure that you are always safe and couldn’t be putting yourself in any kind of danger whilst paddling; remember it’s all for fun! People seem to have very varied opinions on this SUP. Although most people say that it is a very good price, that doesn’t always mean it will be value for money still! One customer said that “don’t go out far and expect to get somewhere or up current” and “Don’t get stuck in an unsafe situation with this board. A nice strong wave could snap it”. However, not all of the Customer reviews are negative in fact the board got an average rating of 4.3 out of 5. A different customer said that the boards were “Easy to assemble, lightweight and manageable” and that they are “very pleased to have made this purchase”. These paddleboards are the ideal starting point for any beginners and are a bargain at $600 for two. Not only do they come with some great safety features such as an ankle leash and adjustable accessory strap but the SUP is also lightweight and easily transportable. But this board correspondingly presents an easy way to get close to friends and/or family whilst having a tiring yet fun workout! It could even be a sly way to help somebody you love lose some weight and improve their fitness. Don’t be afraid to try the fastest growing sport in the world; although we would recommend renting a SUP before forking out a large amount of cash for your very own! We hope this article has helped you make a decision on whether or not to purchase the Wavestorm 9’ 6” and that you enjoy your future paddling experiences.